In 1933, readers were first introduced to Doc Savage, the Man of Bronze. Raised from the cradle to be the pinnacle of mental and physical perfection, Doc Savage travels the world using science and sinews to right wrongs, aid the oppressed, and liberate the innocent. With his team of able associates at their headquarters high atop the tallest building in the world, Doc Savage is tireless in his pursuit of knowledge and justice. 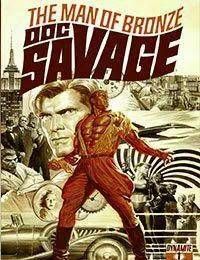 Writer Chris Roberson brings Doc Savage from 1933 through to today. And with Easter eggs along the way that will help pave the future of Doc, in a story only Chris (Roberson) could tell.